Thanks to Hanna Oberhofer for her words and Nancy Arbittier for the beautiful photo of me and my Dad. An excerpt from the Rivard Report article is below. For the article on the entire PechaKucha event, click here. Photo used with permission from the Rivard Report. 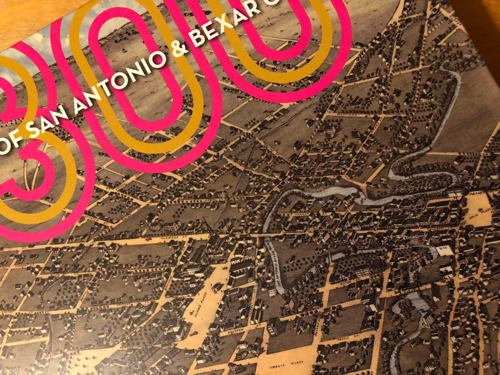 "Elise Urrutia told the story of a magnificent garden that sat on what was the far-northern edge of San Antonio more than 100 years ago. Miraflores, located on Hildebrand Avenue adjacent to the University of the Incarnate Word, would have far more than 20 slides to fill if it could talk. "Urrutia delivered the most educational, historical, and nostalgic presentation of the night as she told tales of her great-grandfather, Dr. Aureliano Urrutia, a respected Mexican surgeon who was exiled to the United States in 1914. Dr. Urrutia built the Gardens at Miraflores and filled it with fascinating art, sculptures, plants, and people. "'I’d venture to say there’s not another place like it in the world,' Elise Urrutia said of the garden that hosted the banquet for the Majestic Theatre’s grand opening in 1929 and embodied her ancestor’s impression of Mexico’s diversity and layers of culture. Although it changed hands five times before the City purchased it in 2006, the property maintains a degree of mysticism and magic – not to mention potential for a city that is heavily investing in its unique assets." Photo by Bonnie Arbittier. Used with permission from the Rivard Report. Mar 22 A Book in the Works!